TEMECULA (RIVERSIDE COUNTY, CALIFORNIA), 1952 22 negatives: ASA001-318 – 339 Box 1. Box 6: 3 degraded negatives ASA001-327, 335, 339 Smithsonian requested ASA to excavate the area to be flooded by a dam; project led by B. E. McCown (McCown, 1955). 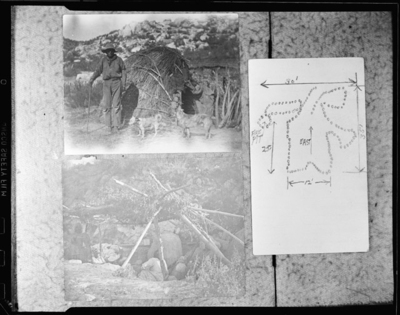 ASA001-318 – 322 copies of prints made for McCown of pictures of a man, dog, hut, floor plan, and an Indian woman weaving a basket (ASA001-318, 319, 321, 322 are undated but Howe filed and numbered them within this 1952 sequence).